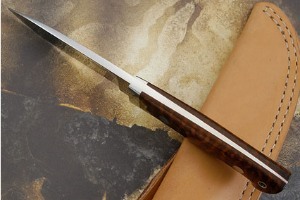 Description: Canadian knifemaker Alain Desaulniers' work is meticulously performed. The influence of Loveless, Steve Johnson and John Young is clearly visible in his exceptional work. 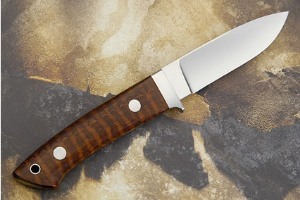 The stainless steel, drop point blade was hollow ground to accentuate the dramatic, clean grind lines. 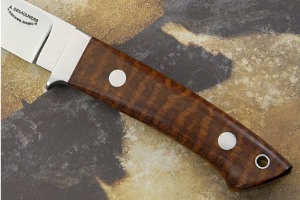 The guard is formed from 416 stainless steel and nicely offsets snakewood scales. The warm brown wood has characteristic chocolate stripes moving through the figure. Snakewood continues to be among my favorite woods. 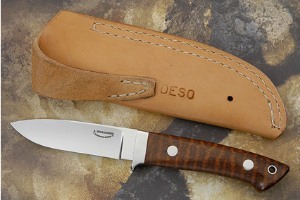 Large stainless rivets and a lanyard hole complete the handle. The full tang ensures strength and durability. A distal taper to both blade and tang results in perfect balance. Red fiber spacers assist the snakewood to adjust to temperature and humidity changes. The handle has been nicely contoured for a very comfortable, secure grip. Exceptional work throughout! 0.390625 0.0625 390.625 62.5 Trailer Started.